Please don’t forget the Deceased’s pets and livestock, they were loved too. 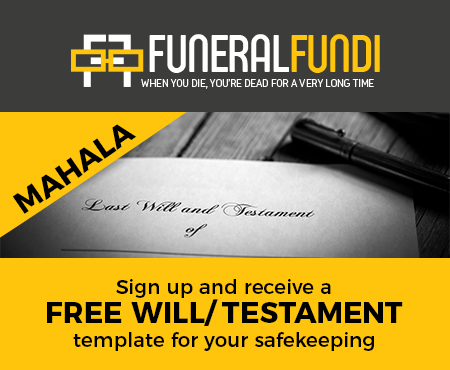 Any Funeral Home will only be too glad to help with the funeral arrangements. Safeguard the Deceased’s home. Don’t neglect the security and safety of all the little things the Deceased has accumulated over the years. You need love now and plenty of it too. Invite all your family and friends but whatever you do, don’t be afraid to ask for help. This is a time when everyone is willing to assist. Find and secure the deceased’s ID document, passport and important papers like the Will (Hopefully it was left behind) and bring it to the attention of the Executor. The Executor will give you a list of things you need to do; paperwork you need to compile for the Master; if needs be, consult an Attorney but only where the value of the Estate exceeds a Statutory stipulated amount. The Deceased wish of “Organ donor” must be respected, please inform all parties at your earliest convenience.